You are here: Home / Check out MediaMikes.com Podcast – Behind The Mikes on Podomatic! 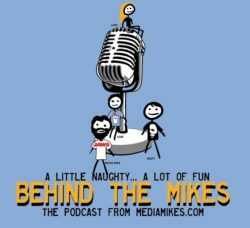 / Misc / Podcast / Check out MediaMikes.com Podcast – Behind The Mikes on Podomatic! Started in 2013, “Behind the Mikes” is your weekly Podcast that covers everything Pop Culture. Join MovieMike, Loaf, Loey and, when we can find him, Brett as they discuss the week’s recent movies, share some trivia and put their irreverent spin on everything Pop Culture. It’s a little naughty… but a lot of fun!